Click the link below to fill out an application to find out if you are approved! We sell all different brands and models of machines and grinders from the largest manufacturers, including La Marzocco, Nuova Simonelli, La Spaziale, Mazzer, etc. If you would like to purchase any machine or grinder we would gladly put together a quote for you! We will handle everything from helping you with the first thoughts of a new machine, down to the training of your staff. Let us take the "scary" out of buying a new machine, give us a call at 425-610-0855. A gorgeous machine handcrafted in Florence, Italy. This machine is as durable and easy to use as they come. It comes in 1,2,3, and 4 group configurations. This machine contains 2-3 boilers (based on configuration), 1 for steam and 1-2 for brew water. Why do you want this? In a traditional machine that only has 1 boiler, all water and steam takes away from your brew temperature. This can affect shot quality during high use times. 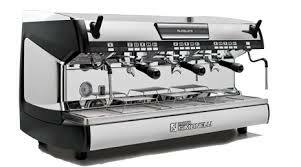 The Marzocco minimizes temp fluctuation by distributing the workload among the boilers. The brew boiler temp is also controlled by an electronic PID as well as a solid state relay. These components are far more accurate, last nearly indefinitely, and use less power than a traditional configuration. Everything on this machine has been designed to last longer and work better. Although this machine costs a little more, the benefits and repair cost savings will outweigh the initial purchase price. The AV which automatically stops the dosing of the shots with 4 programmable buttons and 1 continuous. The EE which has an on/off switch that starts and stops the dosing of the shots. The MP which uses a lever to start and stop the dosing of the shots and allows for pre-infusion. 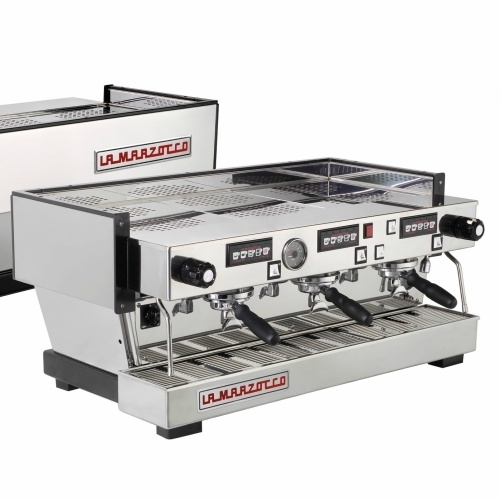 A classy looking machine, the Aurelia II is a refresh of the tried and true Aurelia that dominated the market for many years. This machine looks great in a cafe where it is clearly visible to the customers, or tucked away in a stand quietly pumping out great coffee for people headed to work. 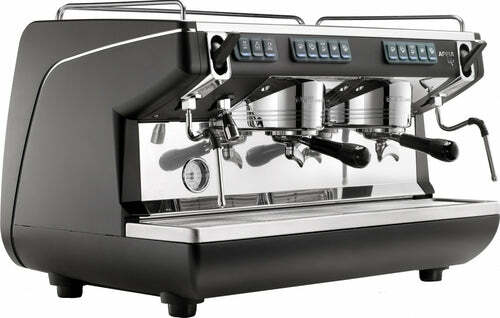 The Aurelia II is durable and consistent, both good qualities in an espresso machine. The locking/short spray steam levers are a favorite among baristas from all over, and the cool touch wands will keep the hand burns away! Due to the fact that many of it's parts are interchangeable with other, as well as older, Simonellis, you know that parts will not be an issue when it is time for a repair. Machine is available with an auto clean cycle and is also optionally available with an auto steam wand called the "magic wand". This wand will steam the milk to a programmable temp and shut itself off, one less thing you have to think about!!! Rumor has it that this is the machine that Unicorns use, perhaps it's the magic wand, or the shape of the steam handles, we are not sure but we trust them just the same. The S which has an on/off switch that starts and stops the dosing of the shots. For the budget minded consumer, the Appia II comes in at a great price point and contains all of the same features as the more expensive machines. Many of the parts are interchangeable with other Simonellis as well. If you need a new machine but cannot justify the higher price tags, this is a great option. The machine comes in 1,2, and 3 group configurations. Where to begin, the Swift grinder is a horse of a different color, in all the right ways! It is actually 2 grinders in 1, containing hoppers and grind chambers for 2 separate beans, decaf and regular, blend and single origin, whatever you want! Insert your portafilter and push a button and the Swift kicks on with a quiet hum, grinding the beans, dosing to exactly the same level, and finally tamping it all by itself. When you pull out the portafilter it is ready to go into the machine and make shots, can you believe it?! The dosing is within 1 gram every time too, so it's very consistent. Again, not the cheapest on our list but what a machine, and no more loss of grounds to the counter, or carpel tunnel syndrome in your baristas from tamping! If you look up the word glorious in the dictionary, you may just see a picture of a Swift. If General Patton had commissioned a grinder to be made, this is probably what it would have looked like. Bulletproof, simple to use, consistent, and inexpensive to maintain. What more could you ask for? 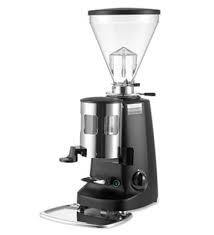 If you want a basic workhorse then this is the grinder for you. There are no downsides to this grinder, which is why it has dominated the grinder industry for many, many years! Also available in an on-demand doserless configuration, a larger flat burr model, and a conical burr model. We have many more options available, these are just a few of the recommended ones. Please call and we can tailor your selection to your needs!